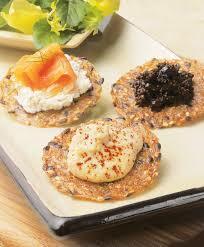 Gluten-free rice crackers with tahini or avocado dressing. A great quick and easy snack. Spread the rice cakes with either the tahini or avocado. Variations: You can also add sardines, home-made gaucamole, home-made hommus, home-made olive tepenade or slices of tomato, cucumber or raddish.